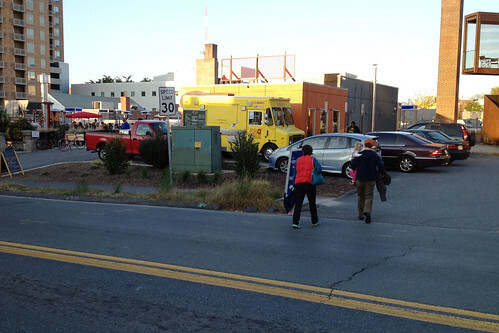 When I moved to East-West Highway in South Silver Spring last fall, I quickly noticed one thing: people cross the street without using crosswalks all the time. Even as the surrounding area becomes more urban and walkable, this street remains a relic of its industrial, car-oriented past. Drivers stop to let a man and his dog cross East-West Highway. All photos by the author. East-West Highway was built in the 1920s to connect Bethesda and Silver Spring and provide an alternative to Military Road in the District. (An extension to Prince George's County came later.) Industrial uses like bottling plants, commercial bakeries, and repair shops sprouted up along the road in Silver Spring. When the Blairs complex was built in the 1950s, the developers purposefully faced it away from East-West Highway because it was so unattractive. When the redevelopment of downtown Silver Spring took off about 10 years ago, those buildings gave way to apartments and condominiums. More recently, businesses including Denizens Brewing Company, Bump 'N Grind, a coffeeshop/record store, and Scion, a restaurant based in Dupont Circle, have flocked to the area. South Silver Spring is now one of the region's youngest neighborhoods, with a large number of transit commuters. Even the owner of the Blairs is embarking on a redevelopment plan to face the street again. 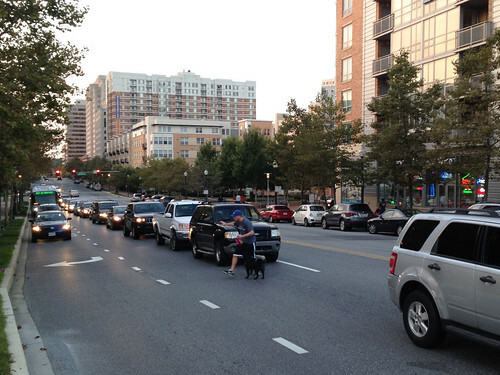 As Silver Spring redeveloped, it became more walkable. But East-West Highway never caught up. Parents run across East-West Highway with their kid. Even though it's fairly narrow, it's still designed like a high-speed commuter route, even as more and more people are walking and bicycling in the area. In some places there are no sidewalks, and the two crosswalks between Georgia Avenue and Colesville Road are each a quarter-mile apart, at least a five-minute walk. Even when you get to a stoplight, the signals are timed to move cars through, making pedestrians wait for up to two minutes to cross. People line up to cross East-West Highway at one of the few stoplights. So people choose to cross where it feels convenient, or safer. In four months of non-scientific observations, I noticed that everyone seemed to cross in a few specific places. I started crossing there as well, and realized that most drivers will stop for you. And when I drove out of my building's garage, I always waited before turning, knowing that someone might be crossing. Where to cross East-West Highway. Stoplights are in red, popular informal crossings are in blue. Click for an interactive map. But this isn't ideal. A century of training people not to walk in the middle of the street means that nobody, including drivers, expects this to happen. Thus, informal crossing points aren't as safe as formal, designated places to cross that pedestrians, bicyclists, and drivers can all recognize. And the unpleasant experience of walking in South Silver Spring depresses foot traffic, which hurts both existing businesses and prevents new ones from opening. Even if it wasn't built for walking, East-West Highway became a place with lots of walkers. It's time for this street to adapt. More crosswalks would be a good start, as would filling in the missing gaps of sidewalk. More stoplights, or pedestrian-only signals called HAWKs, would be even better, as would a median where people could wait while crossing. Yes, these things might cause additional delays for drivers. But as one of those drivers, I'd rather have a slower, safer street with more places to shop and hang out. As its surroundings become more urban, East-West Highway is a highway in name only. Sarah Garcia's comment about the Blair's crosswalk being dangerous was dead on. The eastbound light stays green longer than the westbound one at the end of the cycle, which gives pedestrians (who wait a long time) a false impression that they can start crossing as they see one light turning red. I asked the county to put up a sign ON THE SIDEWALK to warn peds of this, and got the usual response that it's a state road, and it's not their problem. The county could also change the light timing, but seemed uninterested. I think the other larger issue is the "super block" that the lack of pedestrian access over the train tracks creates. The fact that the MARC bridge (which closes each night) is the only place to cross the tracks between Colesville and Georgia (which causes up to a 10 minute walking detour) depresses pedestrian traffic in this area. Also, so many 70/79 buses stop coming down the hill at Colesville on East West, that the ruts/bumps in the turn lane and right lane make this stretch extremely hazardous for cyclists. Thanks for addressing this, Dan! We've been working with the State Highway Administration (E-W Highway is a State and not a County road), and they are planning two crosswalks for 2015. Good news! East West Highway needs crosswalks but that doesn't mean pedestrians won't ignore them. 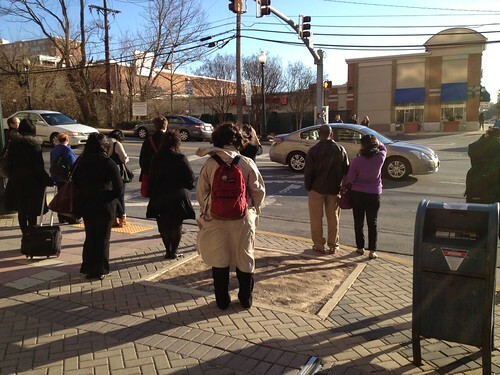 There's a crosswalk at 2nd and Colesville and 2nd and Cameron but pedestrians regularly jay walk between them. There is a new island across from the Veridian. It looks like it may be the beginning of a crosswalk.